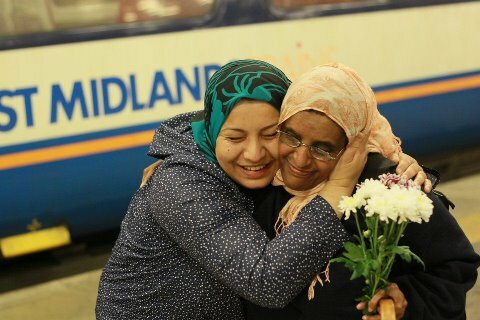 June 2012 people gathered on Sheffield train station to welcome back Lemlem Hussein Abdu… The train rolled in and tears rolled down the faces of many of those who had fought so hard to bring her back to Sheffield. We clapped as Lemlem was assisted off the train with her bags and Gina Clayton (Chair ASSIST, Vice Chair City of Sanctuary) breathed three magical words “We did it”. Lemlem’s case is an incredibly poignant one for activists in Sheffield. For many years Lemlem has been the face of both injustice and forbearance as she has moved through the community with kindness and humour whilst also embodying the fallibility of the UK asylum system and it’s Achilles heel of enforcing destitution upon people who cannot leave. Lemlem was denied asylum by the UKBA, despite having nowhere else in the world to go and having made Sheffield her home. They tried to deport her to Ethiopia no less than three times, despite the fact that Ethiopia and Lemlem’s place of birth Eritrea are different countries. No-one in possession of the facts could fail to see that the Home Office were making an unjustified decision, cynically using the Ethiopian travel document that Lemlem had been issued to dispose of her from Britain on a technicality. The British may be fond of a bit of bureaucracy, but generally I do not think we like a cheat and using the rule book to defeat someone in this dishonest way is certainly “not cricket”. To understand the special significance of Lemlem’s case and those three little words, you need only look to the left or the right of Lemlem and her friends. On Jubilee Bank Holiday on a council estate in Sheffield a 61 year old lady makes her way to a friend’s home. Denied asylum by the UK, this lady has been destitute for the last three years. She is a good friend of Lemlem’s and knows that Lemlem is going to report to the UKBA soon and lodge her fresh claim. The friend and the lady discuss Lemlem’s situation, along with other people that they know – needless to say there is little good news to share. Two women who have been brought to the UK and kept as slaves have had their cases accepted and have each been granted one year to remain in the UK. In each case that year is about to end. In the case of Rose*, she has been trafficked here and used as a prostitute, escaping after three years and hiding for one year before applying for asylum and eventually (after being rejected), being granted the one year… In that time she has managed to secure a place at University, but living from day to day with her fresh claim, has no idea if she will be able to take up that offer. She regularly volunteers to go into schools and talk to pupils about what she has gone through and the impact that her past and current situation has on her life, saying that “If I can help one young person to think before they judge someone and to understand that you do not know what that person has been through, that is enough.” To see the look of respect and appreciation on the children and teachers faces for her honesty and her generosity in sharing her story is a powerful sight. A young family has been issued with removal orders for the 6th June. The friend has been to visit them the day before the jubilee and UKBA officers have arrived demanding that the three family members, mum dad and 1 year old son come to the door shouting “Are you all here? ARE YOU ALL HERE!” Seeing the friend’s children they say “Who’s this? Who is here?” and when they realise that the family have company they confer upon whether they should come back later. Agreeing between themselves that they will come back in half an hour they leave and shortly afterwards, they all leave, dragging a few possessions in one suitcase and a bag, mother and son departing with the friend in the car, dad walking away down the road on his own. The little one did not know what was happening and was happy to be going in a car with some friends. His dad’s “I love you” did not sting his eyes with tears. His little brother or sister is bulging in his mummy’s tummy, seven months gone. What could be more fun than a trip out for the Queen of England’s Diamond Jubilee? Now the jubilee has arrived. The 61 year old lady and her friend sit on a lawn and share a meal – baked beans and rice. The friend has “out-of-date” chicken kiev’s, but the lady refrains owing to them not being halal. They discuss their friends. They discuss Lemlem. “Surely they could not lock her up again?” they say. More chance than another friend who has been detained since before Christmas, been on hunger strike for weeks on end and has recently called from a distant Capital to say “delete the petitions and every reference to me on the internet…” More chance than a friend who after many years waiting and three detailed interviews by the Home Office has finally received a 43 page refusal letter, with so many clauses that he cannot expect legal representation and will now have to represent himself in court. More chance than the lady herself who has little significance to a system that simply does not accept that she is here. So yes, we were happy for Lemlem. We were pleased that she has been granted “Three Years to Remain”. They are so generous. The only sad thing is that those three little words “We did it” are so seldom heard.